At one time writers were able to excite people to revolt against things, nothing has changed in this regard. In the past till this date most of the major wars were started by declarations and signing of the announcement using a pen. All peace treaties to end the wars are also signed by pen. Thus comes in ‘the pen is mightier than the sword’, but we tend to forget that of course. Race and religion are subjects most journalists would rather not touch with a ten foot pole unless it is to document the various festivals. However with Charlie Hebdo and the other journalists, they weren’t afraid from getting a little bit of fame and expressing their thoughts. The recent killing in Paris were brutal and a cowardly act no doubt, murders after all should be condemned to the highest. However where you are expressing freedom of speech in whatever form there are bound to be consequences. Now just imagine if what Charlie Hebdo did was in another country, more towards the east lets say, the reaction would have been a lot different. I can just imagine the weight bearing down on it, with accusations threatening the social fabric of multi-racial, multi-religious societies. Any combination of the Penal Code, Sedition Act and Internal Security Act would have been invoked. Licences stand to be revoked. Apologies, retractions and reparations would have been demanded. But not so in the west. The west takes human rights too far and thus use velvet gloves on them. So it’s basically okay to bash, slam, kill, intimidate and pound any political opponents and religious groups into submission. In doing so they are forgetting the very basis of what freedom of speech stood for in the first place, it was an expression of beliefs, without malicious intent, about anything and everything, without threat of reprisal. However the question now occurs, is it less of free speech but more of a hate speech being used. Another word for it I guess, but reality is people are using this free speech as a basis to extravagant and express their rights freely and openly to be racist, sexist and target religions in a hateful manner in which they seem they have a right to. 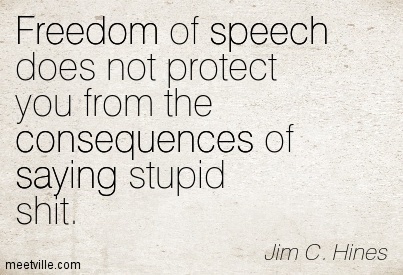 So we all know the only time freedom of speech comes into question is when that freedom is about to be trampled on. The massacre did have a huge backlash against the Muslim communities, in which the terrorists had their roots from. But should you not be responsible to enjoy freedom of speech. Is it simply the hearsay of people who think this is a religion that is afraid of humour does not deserve to endure. Cartoonists across the world have flooded the streets and the internet with powerful drawings and rallies in defiance of the armed gunmen who attempted to silence the satirical French newspaper, Charlie Hebdo. The reaction in France and worldwide was spontaneous – who, after all, would not condemn killing? There’s a saying if you play with fire, you are likely to get burnt. The basic human principle to live in harmony is the key to respect the rights or reputation of others and responsibilities. In this case, the French is not respecting other people. Yes, violence is wrong but then you provoke the people who believe in using violence to settle the dispute. Too bad, this time it’s the small guy provoking the big guy (the guy with guns or swords if I must say) and you face the consequences which harsh results often ending up in bloodshed. Lets define Freedom of speech in other uses and then we will see that the rally with thousands of gatherings, communities getting together for support are biased in itself. A BBC reporter has faced calls to resign after he told the daughter of Holocaust survivors in Paris: ‘Palestinians suffer hugely at Jewish hands as well’. For example, legitimate criticism of Israel’s human rights abuses of the Palestinians is now considered itself as an anti-Semitic hate speech by a number of Jewish leaders and not that of free speech. A bit of hypocrisy is to say the least. Is this not another expression of freedom of speech or is there different rules for different people, different cultures. Its okay to draw pictures, but its not okay to mention Israel’s brutalities or express what you think of the extremists. There are so many double standards now that the glaring hypocrisy has blinded the general population. But it begs to come into questions in why thousands or millions would rally and celebrities would make a political statement – ‘je suis Charlie’ on a man who knew the consequences and yet you never see that amount of media coverage, celebrities or any Politian speaking out on other killings and brutalities committed around the world on a daily basis due to free speech. Killing cannot be condoned. It is the most extreme form of extremism. There are other ways to seek redress, particularly in a liberal democracy. Go protest in front of the newspaper office. Bombard the editor with letters, get a petition up, tell people not to buy or subscribe to it. Set up a magazine to counter Charlie Hebdo. If you are living in a country where the value of freedom of speech has been forged over the years, then try to live by it or work at changing the value system to include greater respect for other religions. Yet what we can see clearly see is a repetitive violation occurring where free speech is now a way of excusing people to express their hatred. It’s kind off like “love thy neighbour” is not for the neighbour you get along with, it is for the neighbour you don’t get along with. There is definitely a fine line between opinion and hate speech I agree!